Tallahassee, FL –The Manufacturers Association of Florida applauds Chairman Danny Burgess and the Florida House of Representatives for passing HB 7085 Workers Compensation Reform today. The bill strikes a delicate balance between injured workers, employers and lawyers while addressing the rising costs of workers compensation insurance. The recent 14.5% increase in workers compensation costs for employers has a direct impact on manufacturers’ ability to secure the necessary insurance for their workers and at the same time keep their businesses viable. The recent increase in workers comp insurance is estimated to cost employers $552 million in the first year; money that could be better spent on growing the business and paying employee salaries. In the small percentage of workers compensation cases that are litigated, attorney’s fees are a significant driver in increasing insurance rates. The reforms of HB 7085 are expected to save 5% or more in employers costs, driving that recent cost increase down again. This is a good step forward in reducing workers comp insurance rates. Tallahassee, FL – The Manufacturers Association of Florida (MAF) is pleased to announce that Amanda Bowen has been appointed as the new Executive Director for the association. In this role, Amanda will lead efforts to improve the business climate for Florida’s manufacturing sector and promote industry engagement with students through the Dream It! Do It! national program. 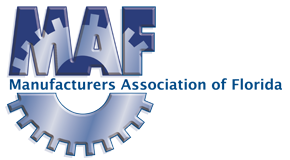 Nancy Stephens, who served as the MAF Executive Director for 13 years and has lobbied for manufacturers for 25 years, will continue to direct the MAF government relations and advocacy program. Amanda has served as the Director of Communications for MAF since 2015 and represents the association on the Florida SBDC Advisory Board. She has a B.A. in Humanities/Communication from Florida State University, and previously served as Regulatory Supervisor at the Florida Department of Health. She has a Six Sigma Green Belt Certification from the Florida Sterling Council and was recognized as the Emerging Leader of the Year from the Tallahassee Leadership Academy in 2015. Amanda is a frequent public speaker on Generational Communication Strategies, Digital Marketplace Transitions, and Personal Branding.